Can’t remember where I picked this tip up from. Most of you will probably have seen it elsewhere, but for them as haven’t it might be useful. The finished photos are not very good, even by the standards of my photography, but they will give an idea. 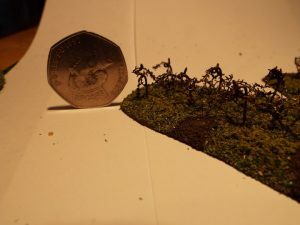 I’m going to pass the finished items over to the ww2 buffs in the group in Horsham where I very occasionally game in the hope that they will work with their 20mm collections. First I cut some strips of 3mm mdf, as usual using the craft knife at an angle to chamfer the sides. I then use a marker pen to mark the position of each stake on the mdf. A pin vise is used to drill a hole at each of these points, and then used a craft knife to cut a groove in the underside of the mdf to link pairs of the stake holes together. I then cut a piece of the soft wire long enough so that it sits in the linking groove for that pair and when each end is put through its hole there is enough protruding from the top of the mdf to provide the pig stake. Pairs are used because they are more stable than 2 single stakes. 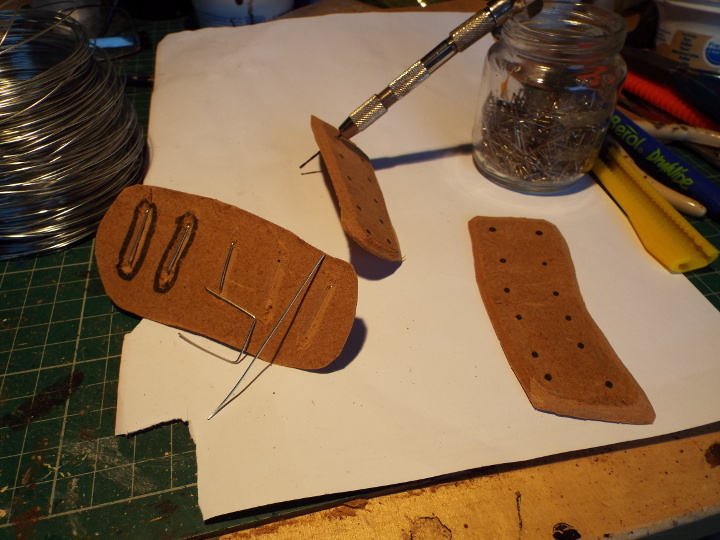 In this picture you can see the underside of the left-most piece of mdf where a couple of pieces of wire, outlined with the marker, have been put in place, and the 3rd piece of wire has been bent into a staple shape to slot into its groove and the holes at each end of that groove. Some gorilla glue has been smeared into each groove to hold the wire in place, and of course the grooves mean that the wires are set in to allow the bases to sit flat on the terrain. 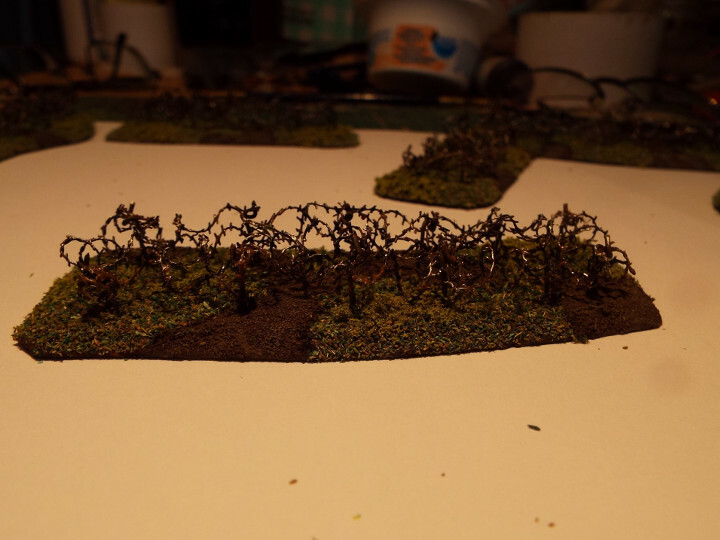 Next I create the barbed wire coils. In the picture below you can see that I have started to cut the next piece parallel to a strand of wire in the mesh. 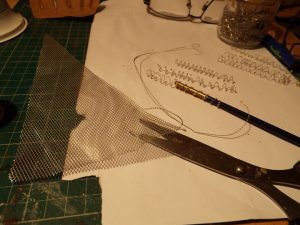 The mesh is soft so scissors are fine, and you can see that it gives me a strip of wire 1 strand thick. This will be wrapped a round a brush handle to create the coil, and as you can see I have a number of these completed. Next, using a narrow set of pliers I twist the top of each stake into the pig-tail shape. I don’t twist them too tightly at this stage – I’ll tighten them later when the ‘barbed wire’ has been added to keep it in place. I then add the coils of barbed wire to link the stakes to get the effect I’m after, and when it’s ok, I’ll tighten the pig-tails on some of them. There are probably patterns for positioning of stakes and laying wire which I should have looked up, but I was lazy. In the picture below the top base shows the wires glued into their slots, the next shows the tops of the stakes bent to create the pig-tails, and the lower a side shot with the barbed wire added. Next it’s just a paint and flock job. I wanted to create the impression of old, rusty wire. 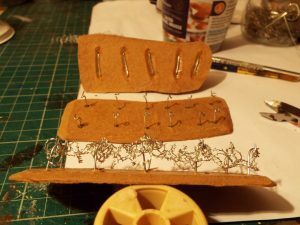 Coat the wire with a mix of black and brown acrylic, to which a bit of water and pva has been mixed. Some bits of wire will reject the paint and stay silver. No matter, I want some bare metal showing anyway. Let that dry and apply a good few daubs of brown paint, and then use a mix of orange and fine playpit sand , applied erratically but with some emphasis on the stakes, to give a rusty effect. Usual basing of sandtex latex masonry paint, flocking most but adding sand to some areas and highlighting as bare earth once the base coat has dried. Finally a very slap-dash dry-brush with some silver on the barbed wire to bring up some of the barbs a bit, lots of swearing at my crappy photography and it’s done. The coin is a uk 50p for scale. Might be that the stakes should be longer – I have certainly seen some with 2 or 3 twists in them. It’s up to you.